The TactileView digital pen is a special version of a ballpoint. The pen writes in ink like a normal pen, but meanwhile determines the position of its tip on the drawing surface. In the pen’s tip is a small transmitter, which sends a signal to a receiver. Upon moving or clicking in the drawing surface with the pen, the receiver transmits this position to the TactileView software, just like a regular computer mouse would. Visual impaired people can operate the TactileView software with the digital pen using the TactiPad or TactileView ClickPad. 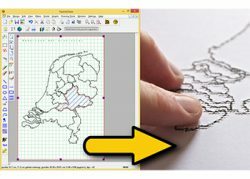 The pen functions as a drawing tool and transmits to the computer what has been drawn, or as a cursor by transmitting on which location has been clicked. 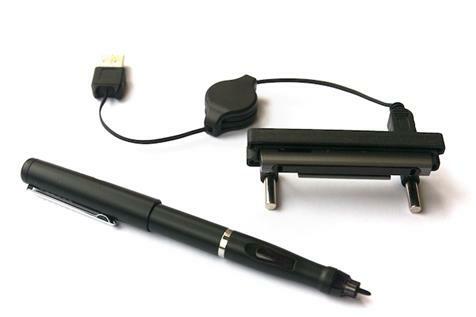 This way, the digital pen enables the user to make a digital version of a tactile diagram or to explore a tactile diagram with speech and sound. 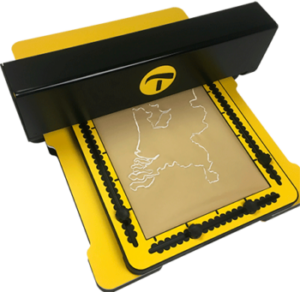 In combination with the TactileView digital pen and the TactileView drawing and production software, the TactiPad becomes a digital drawing tablet for tactile diagrams. Upon drawing with the digital pen on the TactiPad the diagram will appear as a raised line drawing on the plastic drawing sheet, just like using a ballpoint. 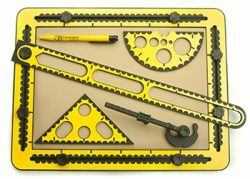 Combined with the drawing tools (ruler, set square and protractor), or just drawn freehand with the digital pen, a tactile diagram immediately arises on the TactiPad. Since the pen also functions as a mouse, the software will record a digital version of the diagram while drawing. This hand-drawn sketch on the TactiPad can be refined with the drawing functions of the TactileView drawing and production software. 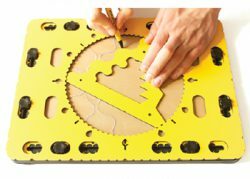 These drawing functions can be used to add shapes like a line, circle square or text labels to the design. This way, these two drawing methods complement each other: the ease of drawing by hand with a pen, and the accuracy of a digital design. 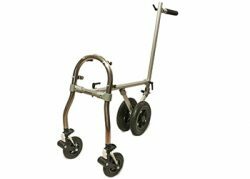 After that, the designs can be produced as a tactile diagram by printing them with a Braille printer or on swell paper. The digital design can be saved, sent as a digital file, or later be printed again as tactile diagram. A diagram designed and printed with the TactileView drawing and production software consists of tactile lines, shapes and text in Braille. A special function of the software enables the designer to add sound information to any part in the diagram. Dots, lines, squares and all other shapes can thus be given extra information with speech or sound. This way, a tactile diagram becomes an audio-tactile diagram. The TactileView ClickPad is specially designed for exploring an audio-tactile diagram. The ClickPad is a clipboard with elastic paper clamps that holds a tactile diagram, as well as a place to attach the receiver for the digital pen. Combined with the TactileView digital pen and the TactileView software, the ClickPad functions just like a touch screen. The TactiPad can be used this way as well when combined with the digital pen and software. The diagram is explored by hand/with your fingers as usual, but by clicking in different places of the design with the pen, the audio information added to the design is played. Colours added to the diagram can be read out as well. 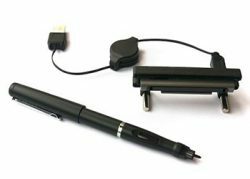 The digital pen functions as a pointing device, and transmits to the computer on which position has been clicked with the pen. When drawing or clicking, the tip of the pen gets slightly pushed in. This activates a miniscule transmitter, which is powered by two small batteries in the pen. The receiver receives the pen’s signal and is connected to the computer with a USB cable. 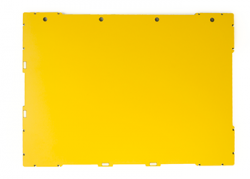 The receiver projects an invisible, electronic grid on the drawing surface of the TactiPad or ClickPad, by which the drawing surface is digitally defined. The movements of the pen are processed by the TactileView drawing and production software. The software calculates the position in the design just like a computer does with a mouse. The holder, containing the receiver is attached to the side of the TactiPad or ClickPad with magnets, creating a tactile, clearly defined drawing surface. When the receiver is connected to the computer, the software automatically recognizes this. All the functions accessible in the software can be selected using the digital pen directly on the TactiPad or ClickPad. Keyboard operation is not required. The menus are activated with ‘long’ and ‘short’ clicks within the drawing surface. Upon pressing ca. one second with the pen on the same location, a menu with drawing options or one of the other menu’s with properties is opened. The options can be selected with short clicks, guided by speech messages. The digital pen alternates between a drawing pen and a clicking mouse. The software works in the design mode for the TactiPad, or in the explore mode for the ClickPad. Different sound signals indicate the status of the pen. The software is designed to work with a screen reader.